Text: Monday, July 6th. — M. de Duras gave us tickets for this week in the box of the gentlemen in waiting. I arrived in time to see the last scene’ of Talma, in ‘Manlius.’ It was the night of his return to the theatre after rather a long absence. On the curtain falling, they called loudly for him, with a noise and a disturbance much more like London than Paris. Three times they in vain began the second piece; it was impossible to hear a word. Three times the two actresses who had to commence the piece took refuge in the side scenes. At last, whilst Baptiste Cadet came forward to address the audience, some officer of the police, in his scarf of office, announced that, by an order of the police, the actors were forbidden to appear upon the stage out of their parts. One might well ask why this rule? which prevents the audience from showing, and the actor from receiving, these marks of approbation. They have much to learn in this country upon the ne quid nimis in the way of government. At last the audience was asked if they would have the second piece, ‘L’Aveugle Clairvoyant.’ Upon the reiterated ‘Ouis’ from the pit, they replied, ‘Vous l’aurez quand ces misérables criards ont cesses.’ On this the noise was renewed for some minutes, after which we had the piece very well acted and very amusing. Comments: Mary Berry (1763-1852) was a British editor, letter writer and diarist, known for her close association with Horace Walpole. Her published journals and correspondence include many theatregoing references. François-Joseph Talma (1762-1826) was the leading French actor of the period. One of his most celebrated roles was than of Manlius in Manlius Capitolinus, the 1698 Roman tragedy by Antoine de La Fosse. L’Aveugle Clairvoyant was written by the prolific French playwright Marc-Antoine Legrand. Text: Went to see Talma in Manlius, one of his best parts, but of a kind I do not care for. One cannot but praise him in it, however. He shouts less than in other pieces. What suit him better than parts in which noble, generous and chivalrous sentiments must be exhibited are those of conspirators and the doers of dark deeds. Altogether Talma possesses one great undisputed merit, and that is the clear forcible way in which he speaks his lines; his declamation is pure, sharp and well punctuated, and consequently original. He is always master of the scene and, in short, his voice makes three-fourths of his success. Comments: Baron Philipp von Neumann (1781-1851) was an Austrian diplomat, posted at the Austrian embassy in London during the 1810s and 1820s. His diaries provide a detailed account of the political and high society life of the time, and document his many visits to the theatre and opera. François-Joseph Talma (1762-1826) was the leading French actor of the period. 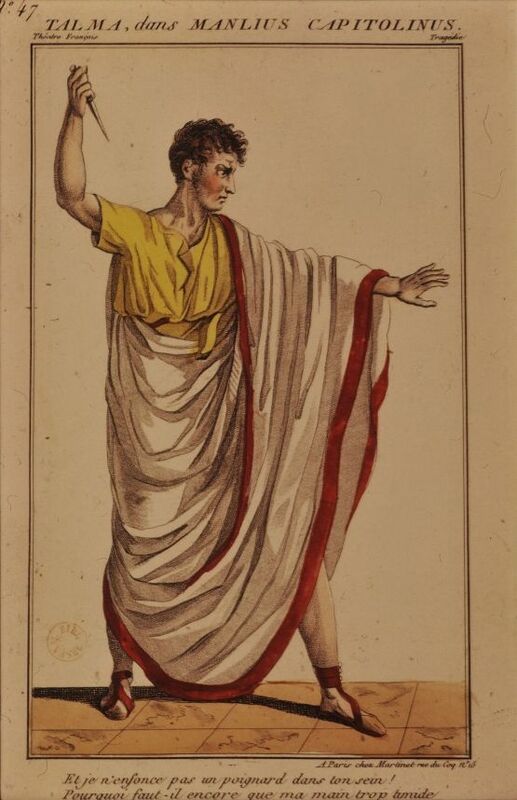 One of his most celebrated roles was than of Manlius in Manlius Capitolinus, the 1698 Roman tragedy by Antoine de La Fosse.